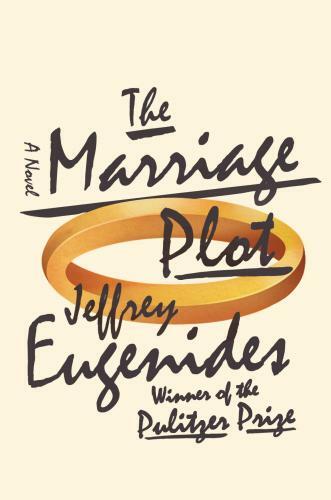 Just finished Jeffrey Eugenides’ The Marriage Plot which I enjoyed very much. [The following contains no big spoilers but I do discuss the book as a whole, which requires some hinting at the way the plot unfolds.] Of course, as someone who went to school at Brown/ in Providence (a decade after the book’s 1980s setting and graduate rather than B.A., though), there was some strong nostalgia operating for me or, perhaps not nostalgia, but personally interested recollection & testing of details (e.g., the diner where two character go to eat seems to be located right by my old apartment, although there was no diner there — could it have folded before my time?). In [Professor] Saunders’s opinion, the novel had reached its apogee with the marriage plot and had never recovered from its disappearance. In the days when success in life had depended on marriage, and marriage had depended on money, novelists had had a subject to write about. The great epics sang of war, the novel of marriage. Sexual equality, good for women, had been bad for the novel. And divorce had undone it completely. What would it matter whom Emma married if she could file for separation later? How would Isabel Archer’s marriage to Gilbert Osmond have been affected by the existence of a prenup? As far as Saunders was concerned, marriage didn’t mean much anymore, and neither did the novel. Where could you find the marriage plot nowadays? You couldn’t. You had to read historical fiction. You had to read non-Western novels involving traditional societies. Afghani novels, Indian novels. Eugenides does cash out this key early riff in various ways, as the eventual winding of the plot involves marriage, a choice between two suitors, a prenup, travel to India, and, for the sake of avoiding spoilers, I’ll just say consideration of various post-marriage options. I am not sure I feel that these themes and ideas are played out in deep enough ways, though, to make this book that perfect choice for the contemporary final text in the marriage course that I’d been imagining (e.g. a course including books by Austen, Eliot, Wharton, Henry James, then finally Eugenides). The problem is that the book seems to suggest in the end that Professor Saunders is correct. The characters do still struggle over marriage and the question of whom to marry, but not very much is at stake in the literal or legal fact of marriage. For a young couple today or in the 1980s who have not yet had kids, it is not too difficult to sever all ties, whether or not a marriage has occurred. A divorce or annulment requires a lawyer, and individuals may (probably will) invest extra meaning in a marriage (as opposed to a “relationship” or what they used to call concubinage in the old days! ), but Professor Saunders’s basic point (about society, anyway) seems true, and this novel bears it out. She felt as if she’d aged twenty years in two weeks. She was no longer a bride or even a young person. This reminded me of Dorothea after her honeymoon with Casaubon (an intentional reference I’m sure), but what has given Madeleine this feeling is her husband’s mental illness (which renders him Casaubon-like in certain respects, including in the bedroom), not marriage as such. If Madeleine exits the marriage, will she be irrevocably changed, altered and damaged in the eyes of the world? Not in the least, so The Marriage Plot can not really be a modern/domestic “epic” in the way Professor Saunders (and George Eliot) assert that nineteenth-century novels were. In fact, Madeleine’s error, as a nascent scholar of Victorian fiction, may be that she misreads literary history and her own lover: she believes she is living in a Marriage Plot but she is actually a protagonist of a Neuronovel: “What has been variously referred to as the novel of consciousness or the psychological or confessional novel—the novel, at any rate, about the workings of a mind—has transformed itself into the neurological novel, wherein the mind becomes the brain” (Marco Roth). I’ve loved Eugenides for so long that The Marriage Plot felt like a serious letdown, both thematically and narratively. What’s even more disappointing is that it might be a DECADE before we see another Eugenides novel (seriously, he’s like the Terence Malick of books). I agree that the book ends up affirming Prof. Saunder’s complaint about the meaninglessness of marriage: my complaint is that Eugenides is sitting on the fence on this one. He wants to be the earnest alternative to the post-mods, but not earnest enough to be mockable. And he wants to say that the marriage plot still has us hooked, while acknowledging all the ways it doesn’t. Thanks for the ref to the Marco Roth article. I really didn’t like McEwan’s Enduring Love, but after reading this piece, I may use it in the class on Original Sin I’m cooking up for next year: how different is neurological determinism than the hoary Christian alternative, really? Any other thoughts of good novels to use? Novels and original sin? Hmm. There’s Jekyll and Hyde which always teaches well. Godwin’s “Caleb Williams,” maybe, though it’s pretty long. Doris Lessing’s “the Fifth Child” is kind of about evil (in a slightly gothic/pulpy way, but interesting, as I recall it). Maybe Melville’s “Billy Budd”? Hawthorne’s stories “The Minister’s Black Veil” or “the Birthmark” could work. I wonder if there could be an interesting choice among contemporary thrillers, something like “Silence of the Lambs.” Some people rave about Frank Miller’s “From Hell,” the graphic-novel version of the Jack the Ripper story… I will continue to ponder!